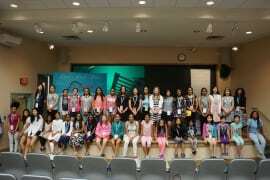 The SheSoft 2017-2018 Championship and Conference on June 2 drew more than 130 individuals, including nearly 50 young technology enthusiasts for a day of competition and learning at George Mason University. 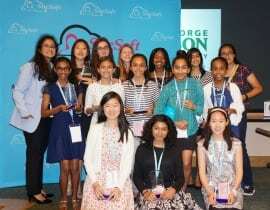 The conference was geared toward girls in fifth through eighth grades and was designed to inspire and empower them to pursue technology education and careers in high school and beyond. The event was under the guidance of Dr. Kamaljeet Sanghera of GMU. 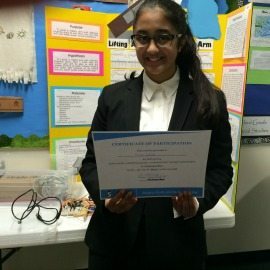 “Girls from D.C., Maryland and Virginia participated in the conference with great energy and enthusiasm,” said SheSoft Founder Kirthi Kumar, a sophomore at Thomas Jefferson High School for Science and Technology who was NCWIT’s Virginia state winner and national honorable mention in 2017 and 2018 as well as the Virginia State 2018 science fair first place winner. WJLA will also feature SheSoft in its Spotlight on Education segment at 5:24 p.m. on June 22. Conference attendees were able to hear from several keynote speakers and panelists as well as workshop presenters including Kirthi; Dr. Sanghera; Nanci Schmizzi, of Fair Oaks Strategies; and Louise Peabody, of STEM for Her. The SheSoft software application contest began in November, and SheSoft provided seminars, webinars and other resources throughout the year. The championship semi-finalists as well as the girls inspired during the workshops and seminars were invited to attend the SheSoft Conference. The conference was filled with technology exhibitions from champion winners as well as hands-on activities, learning workshops and panel discussions. The girls also had the opportunity to participate in live interviews and interactions with Robin Stevens Payes, who created www.edgeofyesterday.com with its “learning through story” approach. All girls were rewarded with an Edge of Yesterday book autographed by the author. The conference concluded with an award ceremony sponsored by STEM for Her, PWC, KPMG, Karsun Solutions, SFA, OCTO, ADS, Robolink, MGTA, Boolean Girl, Mindframe, Codenomics, GMU and Media Press. First place: Vishana Baskaran of Mercer Middle School, Virginia, for Project Quiescent, a stress management app. Second place: Hillary Yoon, Kristine Nysmith and Madeline Magielnicki of Nysmith School for the Gifted, Virginia, for their website project Trifind, which helps create learning opportunities for all. Third place (Tie): Sahar Yousif of Laurel Ridge Elementary School, Virginia, for project building website that helps educate girls and the public about robotics and engineering; and Natalie Pillai of Haycock Elementary School, Virginia, for her App for Autistic Music Therapy using music playback to improve the autism lifestyle. Honorable mentions: Saunté Snowden, D.C. Charter School, for a website related to helping parents find babysitters; Teresa Matthews, D.C. Charter School, for an app targeted at football players and their need for information on other players and stats. First place: Vivian Xiao, Adeline Yu and Sarah Thomas, Roberto Clemente Middle School, Maryland, for their intensive research and app development on obesity. Second place: Anika Gupta, Leila Plunkett and Radha Vinayak, Luther Jackson Middle School, Virginia, for their RePurpose app that improves waste management by connecting the community. Third place: Tie between Nikki Pillai, Longfellow Middle School, Virginia, for her CP Text app helping kids with cerebral palsy communication; and Sneha Kalyan, Rocky Run Middle School, Virginia, for an app that scans the barcodes of medicines. Honorable mentions: Anvi Kalyana, Nysmith School for the Gifted, Virginia, for a project modeling the relationship between antibodies and antigens; Myara Barnes, D.C. Charter School, for a life success app for girls; Samantha Matthews, D.C. Charter School, for a life success app. Next year’s conference will be a national competition.